Most paintings need a focal point. 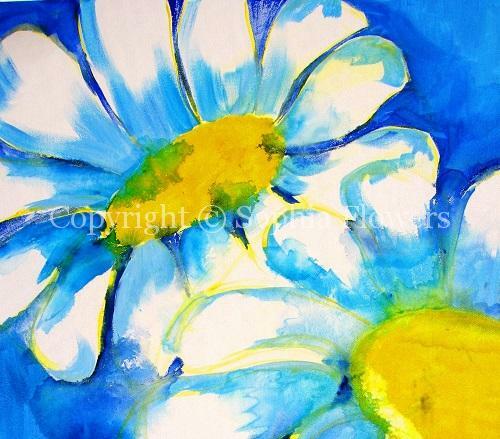 In some paintings, it will be obvious as above – the focal point is simply the daisy or in a sea scene, it may be the simplicity of the horizon line itself. Sometimes, though, with expressive paintings, more is left to the imagination. However, there still needs to be a focal point – a part of the painting that is drawn out in more detail, or that is brighter or that carries an interesting shape. It may even be the colour and direction of light that is the evocative part of the painting. Once there is a focal point, the rest of the painting can be left to the imagination. In most cases, this will happen naturally when painting intuitively.